"This week, we announced a $75 million investment that ensures every high school in Chicago will have a state-of-the-art science lab by 2021, meaning that more than 80 schools in neighborhoods throughout the city will get major capital improvements. We are excited to let you know that your school has been selected to receive a new science lab. " We will be starting tryouts for 16" Softball on Monday August 13th at Pasteur Park. The start time will be 245pm for approximately 2 hours. Hancock will be hosting its annual Summer Volleyball Camp starting July 16. There will be 3 separate camps each starting on Monday and running until Thursday of that same week. Camp will be from 9 a.m.-12 noon. It will be a great way to refine your skills and improve your game. Click on the attachment for the registration form. Are you interested in transferring to Hancock for the Fall of 2018? We are now accepting applications for students in grades 10-11 ONLY during July. Applications are due July 20th! Please be sure to include all documents in your original application. Students will be notified in August to plan accordingly for the next school year. 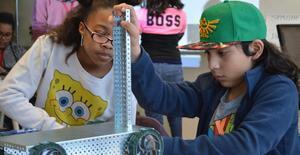 Are you a current 5th, 6th or 7th grader interested in engineering and robotics? You won't want to miss this exciting opportunity to join our summer engineering camp!